The New York Yankees head to Globe Life Park on Friday, September 8, 2017 to take on the Texas Rangers. The expected starting pitchers are Masahiro Tanaka for the Yankees and Martin Perez for the Rangers. The odds for this matchup have New York at -145 and Texas at +135. The Yankees have a 71-64-3 over/under mark and a 73-65-0 run line record. The Rangers are 78-61-0 against the run line and have a 63-70-6 over/under record. The Yankees have a 74-64 overall record this season. Starting pitcher Masahiro Tanaka has a 11-10 record with an earned run average of 4.54 and a WHIP of 1.24. He has 158 strikeouts over his 154.2 innings pitched and he's given up 155 hits. He allows 9 hits per 9 innings and he has a FIP of 4.36. The bullpen has an earned run average of 3.44 and they have given up 354 base hits on the year. Teams are hitting .207 against the bullpen and they've struck out 550 hitters and walked 190 batters. As a team, New York allows 7.9 hits per nine innings while striking out 9.6 batters per nine innings. They are 5th in the league in team earned run average at 3.78. 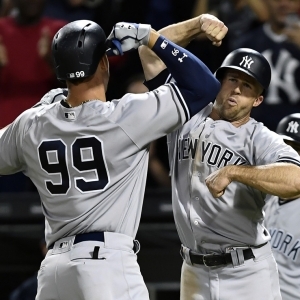 The Yankees pitchers collectively have given up 1,085 base hits and 520 earned runs. They have allowed 169 home runs this season, ranking them 19th in the league. New York as a pitching staff has walked 430 batters and struck out 1,313. They have walked 3.1 men per 9 innings while striking out 9.6 per 9. They have a team WHIP of 1.23 and their FIP as a unit is 3.95. As a team New York is hitting .260, good for 9th in the league. The Yankees hold a .438 team slugging percentage and an on-base percentage of .337, which is good for 3rd in baseball. They rank 6th in MLB with 9.0 hits per game. Brett Gardner is hitting .255 with an on-base percentage of .344. He has 131 hits this season in 513 at bats with 54 runs batted in. He has a slugging percentage of .423 and an OPS+ of 100. Aaron Judge is hitting .277 this year and he has an on-base percentage of .412. He has totaled 130 hits and he has driven in 85 men in 470 at bats. His OPS+ is 154 while his slugging percentage is at .570. The Yankees have 1,243 hits, including 219 doubles and 198 home runs. New York has walked 528 times so far this season and they have struck out 1,211 times as a unit. They have left 1,019 men on base and have a team OPS of .775. They score 5.2 runs per contest and have scored a total of 717 runs this year. Texas has a 70-69 overall mark this year. With an earned run average of 4.87, Martin Perez has a 11-10 record and a 1.55 WHIP. He has 98 strikeouts over the 157 innings he's pitched. He's also given up 191 hits. He allows 10.9 hits per nine innings and his FIP stands at 4.45. The bullpen has an earned run average of 4.47 and they have given up 446 base hits on the year. Teams are hitting .261 against the Rangers bullpen. Their relievers have struck out 400 batters and walked 195 opposing hitters. As a team, Texas allows 8.9 hits per nine innings while striking out 7 batters per nine innings. They are 14th in the league in team earned run average at 4.48. The Rangers pitchers as a team have surrendered 1,225 base knocks and 614 earned runs this season. They have given up 178 home runs this year, which ranks 12th in Major League Baseball. Texas as a staff has walked 481 hitters and struck out 960 batters. They give up a walk 3.5 times per 9 innings while they strike out 7 per 9. Their team WHIP is 1.38 while their FIP as a staff is 4.76. As a team, they are batting .248, good for 22nd in the league. The Rangers hold a .444 team slugging percentage and an on-base percentage of .327, which is good for 14th in baseball. They rank 24th in MLB with 8.3 hits per contest. Elvis Andrus comes into this matchup batting .304 with an OBP of .345. He has 170 hits this year along with 80 RBI in 559 AB's. He maintains a slugging percentage of .494 with an OPS+ of 115. Nomar Mazara is hitting .259 this season and he has an OBP of .334. He has collected 124 hits in 478 at bats while driving in 90 runs. He has an OPS+ of 99 and a slugging percentage of .439. The Rangers as a unit have 1,159 base hits, including 221 doubles and 218 homers. Texas has walked 486 times this year and they have struck out on 1,255 occasions. They have had 880 men left on base and have an OPS of .770. They have scored 5.16 runs per game and totaled 717 runs this season. Who will win tonight's Yankees/Rangers MLB game against the spread?